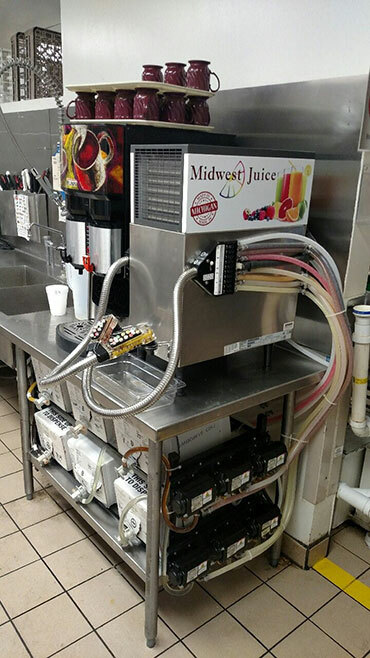 All the juice you need, at the push of a button. 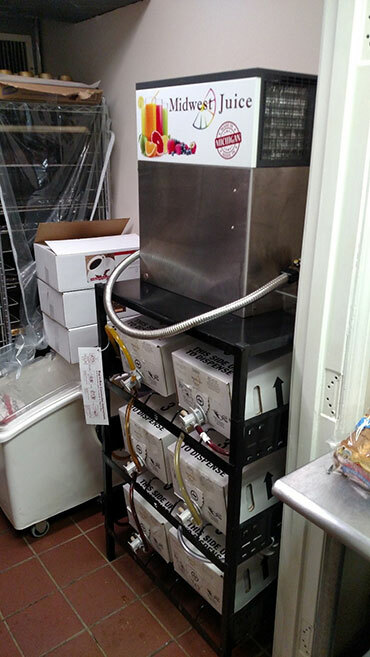 Dispenses 4 to 12 flavors out of one small juice gun. Fill 100 servings in 3 minutes. 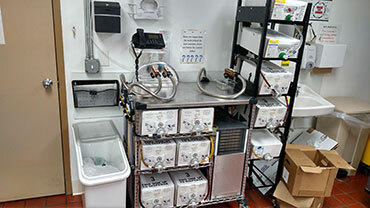 Removable refrigeration deck. All installation from front of unit. 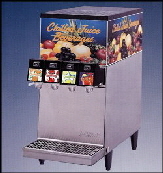 range of post-mix juice dispensers comes with two-flavor and four-flavor models. 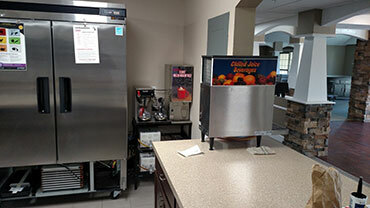 It supports a wide variety of post-mix products including juices, and teas. Options include flush/non-flush, and push button. Pour over feature on all models. Hot water faucets on all models except CWT versions. Back-up pour over feature on all models. Hot water faucet on all models except CWT brewers. Attractive appearance and narrow 12" (30.5 cm) width. 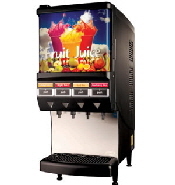 Dispense over 125 - 5 oz. 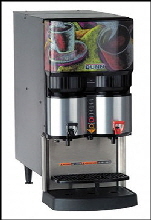 (148 ml) cups per hour with a 120 volt, 15 amp electrical connection or over 500 - 5 oz. 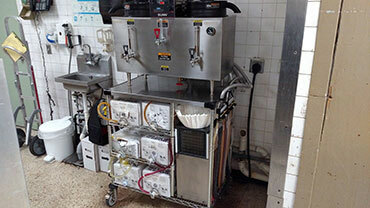 (148 ml) cups per hour with a 240 volt / 30 amp electrical connection. Uses .5 gallon (1.9 liter) and 1 gallon (3.8 liter) bag-in-box (BIB) containers. 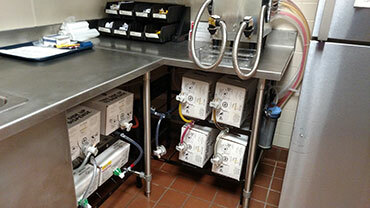 Insulated product cabinet assures maximum product life. Refill LED lights alert the operator for concentrate. 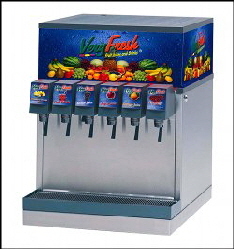 FlavorGard® technology continuously monitors extract-to-water ratio and assures flavor consistency. 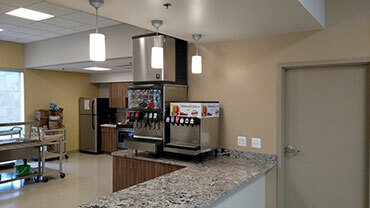 Easy-to-program one touch portion control model available. Brews 16.3 to 18.9 gallons (61.7 to 71.5 liters) of perfect coffee per hour. Brews .5, 1, or 1.5 gallon (1.9, 3.8 and 5.7 liter) batches. 1.5 GPR portable server has a patented Safety-Fresh® brew-through lid with vapor seal and spill protection. Brews 11.4 gallons (43.2 liters) of perfect coffee per hour. 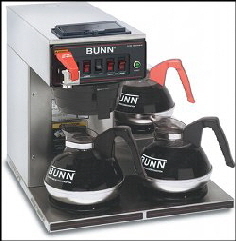 Three gallon (11.4 liters) coffee urn measuring only 14" wide fits most counters. Automatic drip brewing of delicious coffee every time. Large water tank-over 10 gallons. 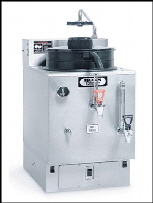 Draw off hot water during brewing cycle without affecting delivery of coffee. Can brew full or half batches. 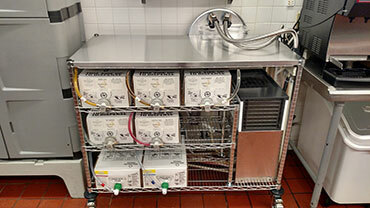 Top mounted components for ease of service. Brews 16.3 to 18.8 gallons (61.7 to 71.2 liters) of perfect coffee per hour. Unique design assures extremely low evaporation loss to maintain the brew at its flavorful peak. Large water tank holds over 20 gallons hot water. 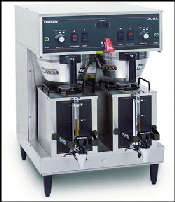 Draw off hot water during brewing cycle without affecting coffee quality.